We’ll start with the tricky part. Caramel. Don’t worry though, after making three batches, I think I’ve perfected the ratio of sugar to water to cream. Actually, I knew what I had to differently after the first batch, I just failed to read my own recipe during round two. Stupid. Oh, well, now I have a jar of pourable espresso-caramel to douse vanilla ice cream with after the bars are history. Sugar, instant espresso, and a titch of cream of tartar to keep it smooth. 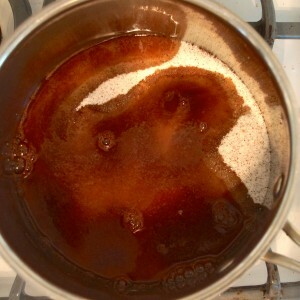 Add water, let it bubble up and get all caramel-y, then stir in cream and cool. 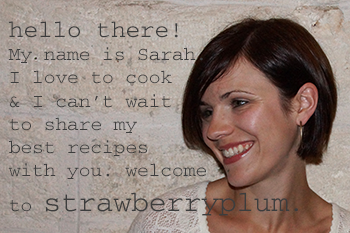 Did you spy the candy thermometer? Yes, you should use one, but don’t let it intimidate you. I swear it’s not difficult and the base of the bars is so dang easy you’ll forgive me for making you sweat over the filling. For the bar base, a.k.a. 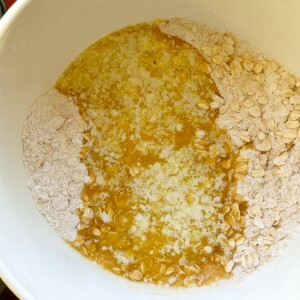 vehicle for yummy caramel, mix flour, oats, and brown sugar with melted butter. 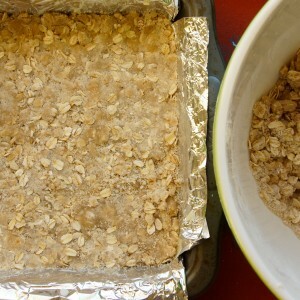 Press half of the crumbly dough into a foil-lined pan. Bake, cool. Spread caramel over crust, sprinkle with flaky sea salt, cover with remaining crust crumbles, and pop the concoction back in the oven. The bars will emerge from the oven smelling magical. 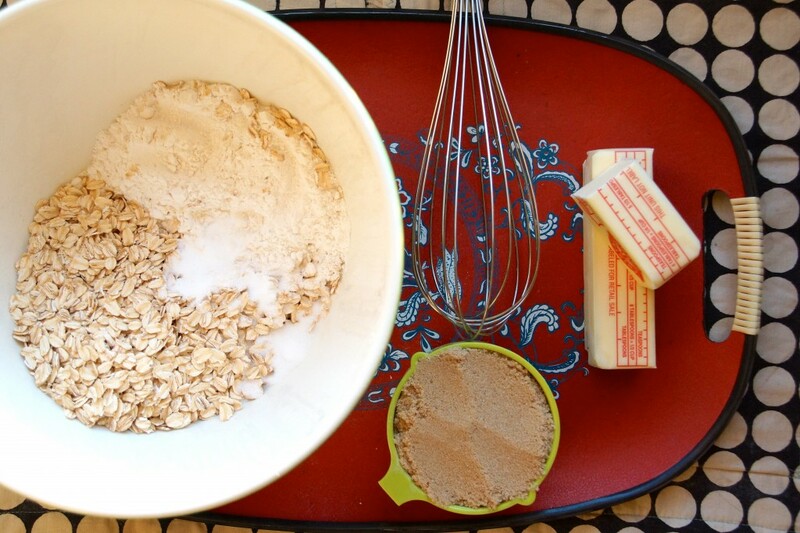 Butter, coffee, oatmeal. Hmmm…all morning things. Maybe you’ll catch me with caramel between my teeth at 8 am after all. 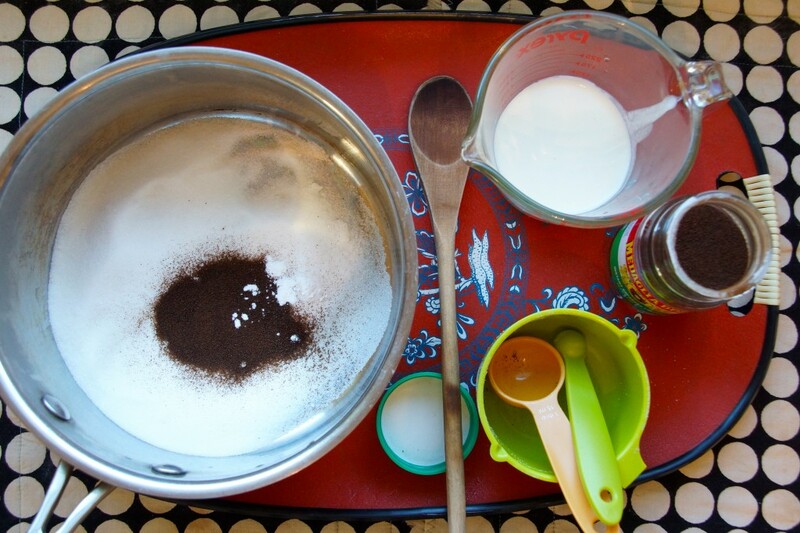 In a large saucepan, combine sugar, espresso powder, and cream of tartar. Pour in ¼ c. water and place over high heat. Let it bubble, undisturbed, until it reaches 250°. Slowly pour in cream while stirring. Remove from heat and cool. Preheat oven to 350°. Line a 9"x9" baking pan with foil and lightly grease. 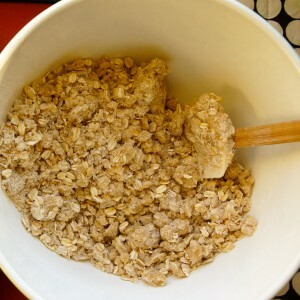 In a large bowl, combine flour, oats, brown sugar, baking powder, and ¾ tsp. salt. Whisk until well combined. Add melted butter and stir until large crumbs form. 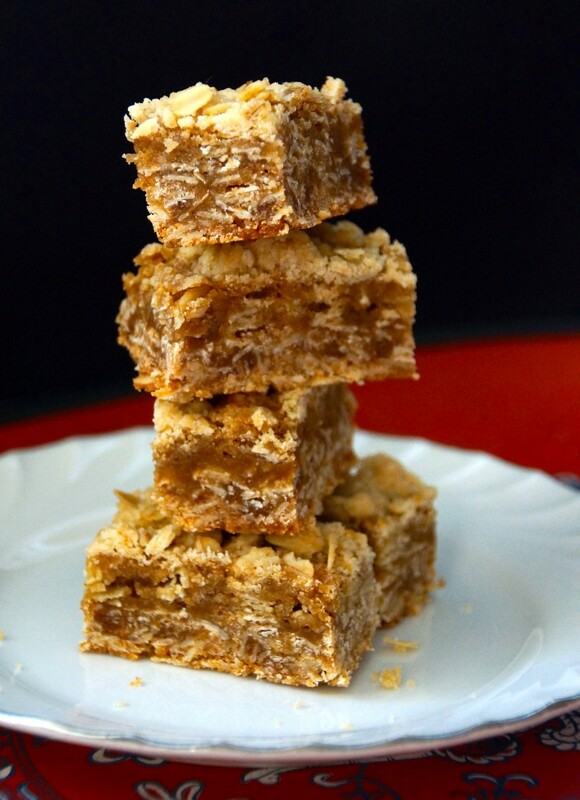 Press half of the crumbs into the prepared pan and bake for 15 minutes. Allow to cool briefly before continuing. 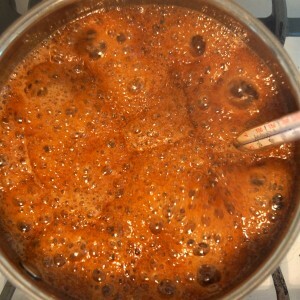 Spread caramel over cooled bar base. Sprinkle caramel with flaky sea salt. 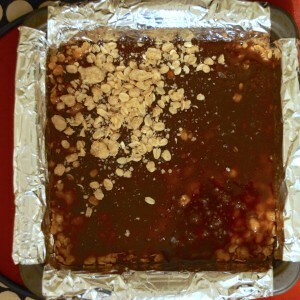 Cover caramel with remaining crumbs and bake for 20-25 minutes until top is lightly golden. Cool completely. 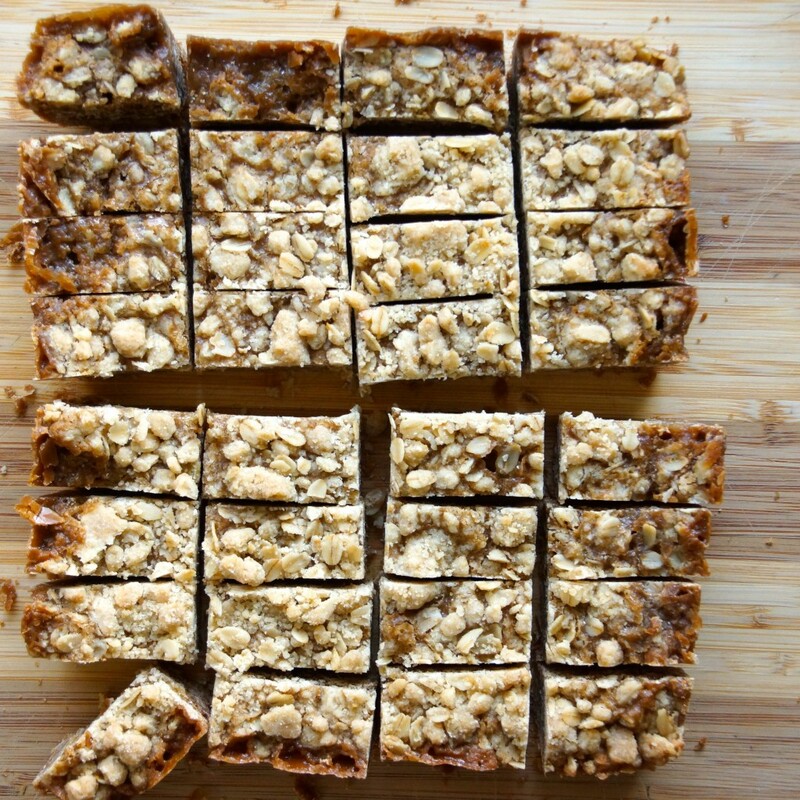 Remove from pan and cut into squares or rectangles. I hope you like them. I used a fairly conservative amount of sea salt on the caramel- depending on your salted caramel preference you may want a pinch more. Delicious! I think I have one or two left – I will eat it before Zumba!!!! Good idea- they should keep your energy up! How many grams are your sticks of butter? I’m in Australia so it may vary!